On Feb. 1 a cow at the Nancy Vogelsberg-Busch family farm north of Home City had twins. 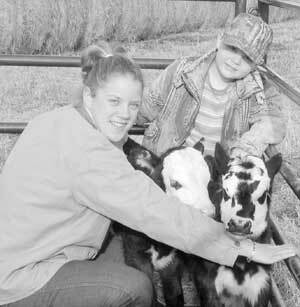 “ In 21 years of farming and raising cattle I never had a set of twins,” Nancy said. Vogelsberg-Busch called her son Noah and daughter, Ali, who are away at college, and they came home on the weekend to celebrate with their mother and younger brother, Isaac.A day after Noah and Ali left, a second set of twins was born. A week later, a third set was born. Then a fourth set arrived. That might not be unusual in a herd of 500, but the Busches have 25 cows. Nancy checked with an expert at the U.S. Department of Agriculture research center in Clay Center, Neb., who said the twin rate in dairy cattle is 3 percent and the rate in beef cattle is 1 percent. The Busches’ rate is 16 percent. She called the research center when friends and fellow farmers started crediting the bull. The center expert, who has done a lot of research on twins, said it’s not the bull that gets the credit but the mothers of the babies and their mothers and fathers. He also said there was an environmental component, which science doesn’t fully understand, Nancy said. “ To me, it’s an act of nature, a gift from God,” she said. She also has another theory. When the second set of twins was born she thought about the single blue heron she used to see circling her farm. The bird had flown alone over the farm for 10 years. “ The kids and I saw it as a good omen, because there are enough bad things that happen on the farm you have to think of good omens,” Nancy said. Late last summer she saw two blue herons circling above the farm and realized the lone blue heron had a mate. “ I took that as a really good sign,” she said. Then this spring the twins arrived. All are fraternal twins. Three sets were heifers, and one was a heifer and bull. One heifer died. Ali’s cow, Liz, had the heifer-bull set, and Ali named the heifer Lizzie and the bull Luke. There is a 95 percent chance that Lizzie is sterile, but the family has decided to keep the brockle-face heifer anyway as a mascot. “ She is such a sweetheart,” Ali said. Nancy said she recently heard that the oldest Hereford cow died at age 38 giving birth to her 35th calf. “ We think that with no burden of calving, Lizzie could live to be 40,” Nancy said. The ancestry of the Busches’ herd goes back to Bossie, Nancy’s parents’ milk cow who was a Guernsey-Angus cross. Nancy bred Bossie to Holstein bulls and kept the heifers, which she then bred to a polled Hereford bull that came from Jim and Sue Rowland, Marysville. The bull was an orphan that Nancy got as a newborn. One of the offspring was Liz, which became Ali’s first calf. Liz was born premature, but Ali was thrilled anyway. “ It was such a big deal — it was mine,” she said. Nancy is particular about documenting the ancestry of her cattle and uses names and not just numbers. For example, Bossie had Belle, who had Beth, who had Liz. Liz is also the mother of Anna, who had one of the sets of twins this year. Ali, a freshman at Kansas State University, helps keep track of the herd history and health records. Bossie is one of the three things Nancy received from her parents, she said. Her father, John Vogelsberg, died in 1992 and her mother, Loretta, is in CMH Long Term Care in Marysville. The other two things, Nancy said, were the first right of refusal to buy land and the skills to farm. The Busches keep their heifers as replacement heifers because of their good dispositions, Nancy said, and then they’re bred to a purebred bull. She expects the sets of twins to be good for her new business, Bossie’s Best, which is organically grown beef. The beef is certified organic by the Organic Crop Improvement Association, which is recognized by the federal government as a certifying agent and is currently the only one for beef. Nancy has been working with Ron Hards at Welch Brothers Meat Co. in Frankfort and government officials so that Welch can become Nancy’s contract processor. Nancy started marketing Bossie’s Best last year to a close circle of friends, and her business has grown by word of mouth. “ I put a lot of my energy in the product and not the packaging,” she said. Her customers now include a professor at K-State whose family from Argentina is coming to visit this spring, and he plans to have a barbecue for them and later visit the Busch farm. Nancy’s customers range from a woman who is chemical-sensitive and can have no antibiotics in the meat to a fellow farmer who, Nancy said, couldn’t care less about organic beef but likes the flavor and tenderness of Bossie’s Best. A grocery store in Manhattan is interested in carrying her beef, she said. Direct marketing lets her price her own product. She does not use growth hormones or antibiotics in the cattle and from the third stage of gestation to slaughter, the animals can have no feed that is not OCIA-certified. Nancy’s whole farm is OCIA-certified. If she has to treat a cow for a specific ailment with antibiotics, that animal is not sold as organic and is later sold at the sale barn. “ There is an extensive audit trail of each animal from birth to slaughter,” she said. Noah is a junior in biology at Emporia State University and will student teach next fall with David Sampson at MHS. Ali is majoring in kinesiology at K-State and plans a minor in animal science. She used her computer skills to design Bossie’s Best business cards and is working on a brochure and a Web site. Isaac is a first-grader at St. Gregory’s and has taken over the sweet corn business from Noah and Ali. Nancy also works at Tension Envelope. She is co-chairman of the livestock committee for the Kansas Organic Producers and said what she is doing can be duplicated on any farm that is OCIA certified. She’s been invited to participate as a “resource practitioner” at one of the sessions at a conference at Yale University May 11 to 14. The theme is “The Good in Nature and Humanity: Connecting Science, Religion and the Natural World.” Scientists, religious and spiritual leaders, conservationists and resource users will attend. The conference is a collaborative effort of the Yale School of Forestry and Environmental Studies, the Yale Divinity School, the Wilderness Society and the National Religious Partnership for the Environment and the Forum on Religion and Ecology. Ali said she’s proud of her mother and what she’s accomplished. “ I have been involved with cattle my whole life and have contributed to the work being done on our family farm, along with my brothers, but none of it could have been possible without my mother,” Ali said. “She is a very amazing and courageous woman. Her strength and energy is unbelievable and is an incentive to me to carry on our family tradition. Ali said she wanted to someday give her children the opportunities she was given. “ My mother always wants what is best for me and my brothers, but at the same time she wants us to work hard and find out what is best for ourselves,” she said.